When a new lead is automatically dropped into your lead manager from one of your lead contact forms OR from your listing in Aisle Planner's marketplace, you have the option to specify who is automatically assigned to that lead. The default is set to assign each new lead to owner of the account in Aisle Planner, you can change this or add additional assignments. 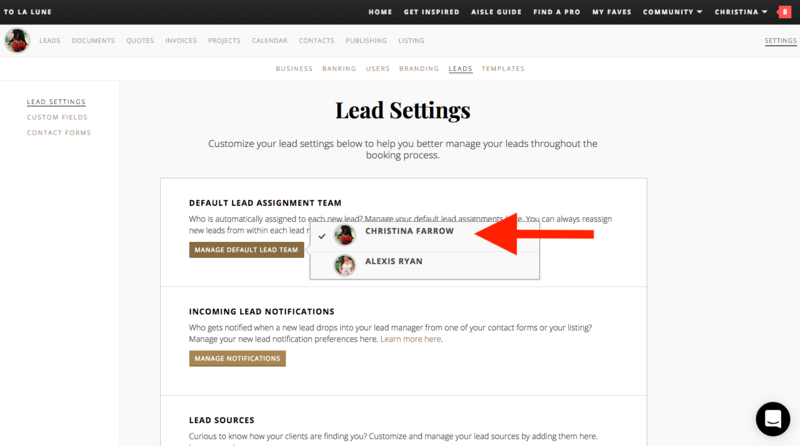 To get started, head on over to the Settings tab and click on Leads - you'll see a Default Lead Assignment Team section to the top, then click on the gold Manage Default Lead Team button. Click on the names of any team members who should automatically be assigned to each new lead. We recommend that you assign one person to automatically be assigned to each new lead that comes into your lead manager via your contact forms or your listing in Aisle Planner to avoid any confusion about responsibilities when it comes to managing each new lead. If you'll be assigning multiple people to a lead, be sure to set a process plan in place with your team! Regardless of who is automatically assigned to a lead, you can always reassign new leads (or assign additional people to a lead) from within each lead record.